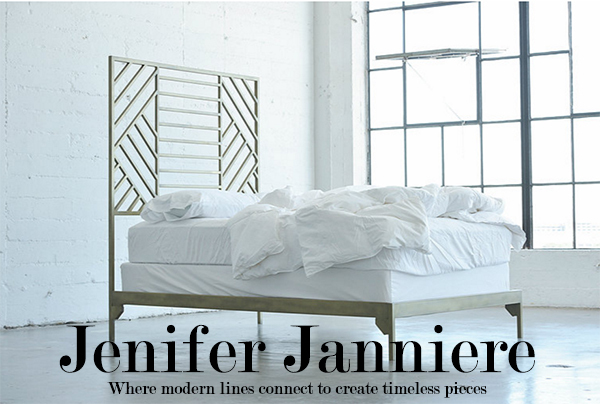 When Jenifer Janniere contacted me regarding her new furniture brand, I knew I had to feature her amazing designs. 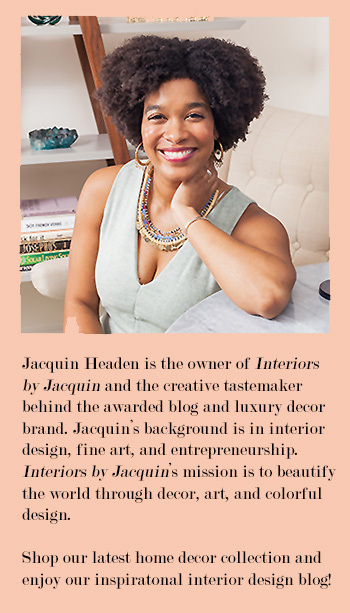 Jenifer’s background is interior design but she has found a new passion in furniture design. Jenifer’s bold, geometric designs blend the line between art deco and contemporary, adding a bit of edge and interest to any space. My favorite piece from her inaugural collection is the stunning geometric bookcase shown below. Jenifer’s design process is quite impressive and intricate, and fully directed by Jenifer herself. In terms of production, each piece is crafted in powder-coated 16 gauge steel that is treated with a hand-applied gold finish for a luxury feel. Jenifer also offers black and antique brass finishes for those wanting a slightly different look. 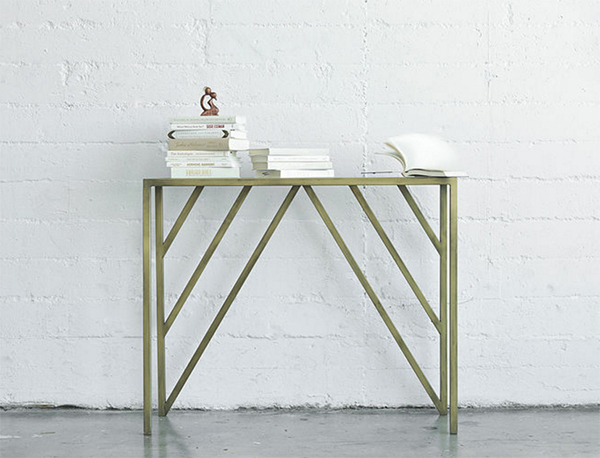 Jenifer Janniere C2 Console Table. Want a peek at what Jenifer Janniere’s designs look like in a residential space? Take a look at this lovely staging from store As Of Now, which currently carries Jenifer Janniere’s line of contemporary furniture. Jenifer Janniere Arrow Side Table. There are just so many great pieces to choose from. 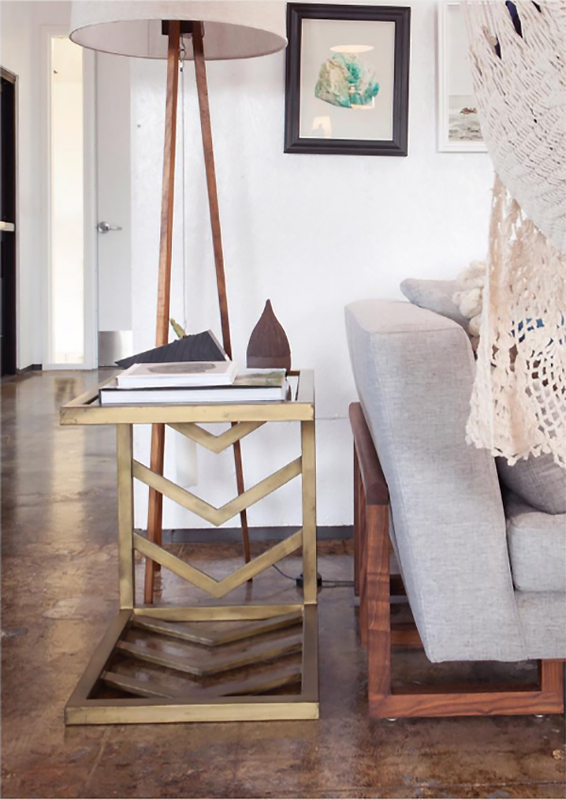 I really love her bed frame design and arrow side table as well. You can shop Jenifer Janniere‘s new collection through her website or the As Of Now store. Which Jenifer Janniere design is your favorite?